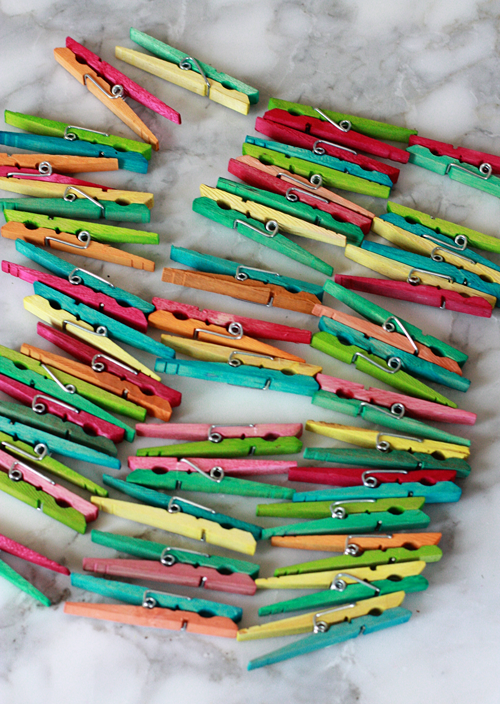 Clothespins aren't just for hanging up laundry –they are a clever and inexpensive workhorse for all around the house! Everything from displaying children’s artwork, to wrapping presents, to sealing off an open bag of chips. Why would anybody buy a $2 chip clip when you can buy 36 clothespins for a dollar? 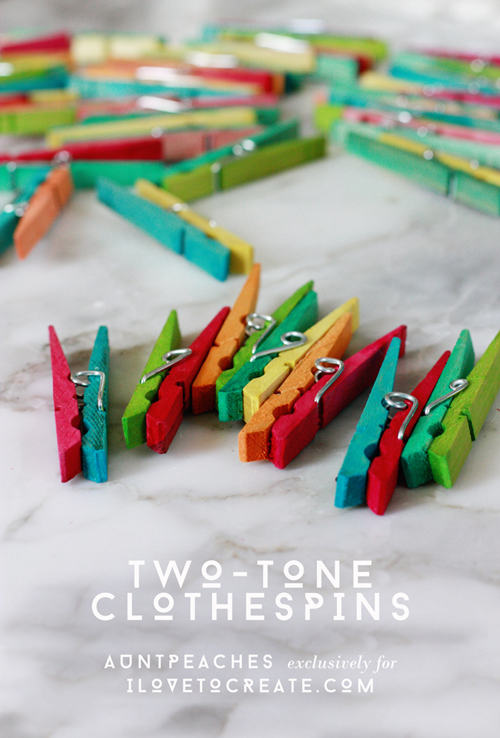 A clever organizing staple in any classroom, a bundle of these candy colored clothespins make for a fun and inexpensive teacher’s gift any time of year! Tulip One-Step Mini Tie Dye Kit. It is important to use a fabric-safe dye to avoid color coming off on paper, skin or clothing down the line. 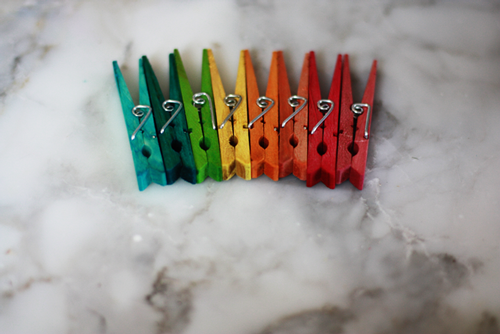 Wooden Clothespins. Quantity is up to you. 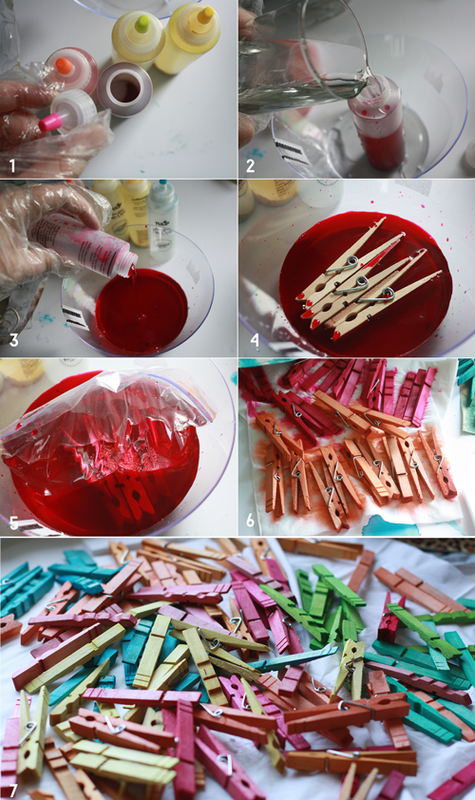 This kit will provide ample dye for hundreds of clothespins, possibly thousands, depending on how saturated you want the color to come out. 1. Open the top of the dye bottle. 2. Fill bottle with water and shake. 3. Pour contents into a bowl. Optional: Add more water to create a larger (but less saturated) dye bath. 4. Insert clothespins in the water. 5. 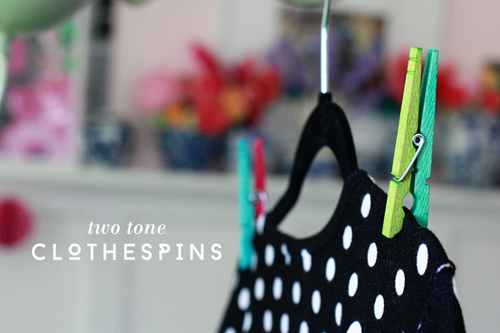 To prevent the clothespins from floating, weigh them down using a ziplock bag filled with water. 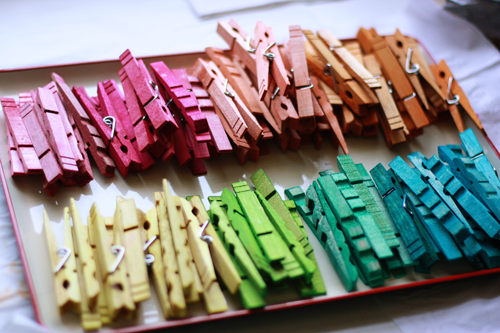 Let the clothespins soak for at least 30 minutes (feel free to leave in overnight for more saturated colors). 6. 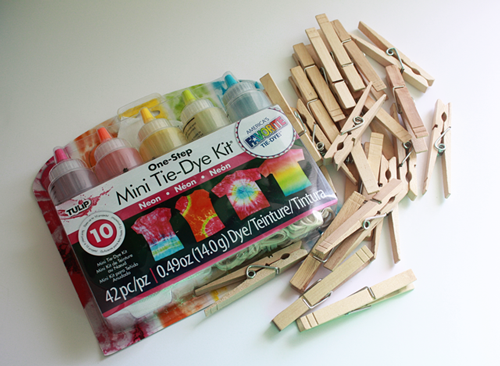 Remove the clothespins from the dye bath and allow to dry on rags or paper towels. 7. Using your fingers or a pair of pliers to remove springs. Sorting the colors into piles will help you create the optimum color combinations. If you have leftover dye, try mixing colors and see what subtle color variations you can make on your own. You could also skip the part about removing the springs. 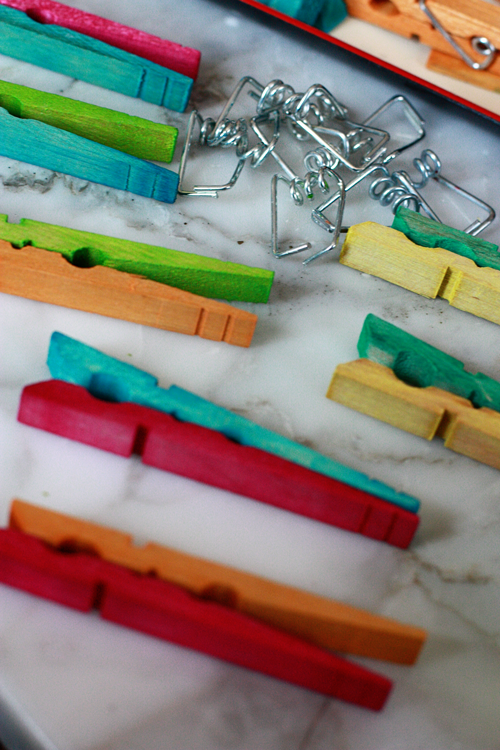 One color clothespins look pretty nifty as is. ...look whose closet just got a little bit brighter? is the dye permanent or will it stain wet clothes if you use them to hang up your laundry? I have the same question as Anonymous - will the clothespins stain wet clothes if you use them to hang them up? I think if both items were dry, it wouldn't be problem. I haven't had to much trouble putting clothespins back together, but it does take a certain technique. * the dye should be set in the wood but some woods may be treated with sealers...so why risk it? I'd use regular pins for laundry and save the colorful ones for all the hundred of other things you can do around the house. *I did not have a problem getting the springs back on so long as I had one "good" clothespin to mimic. I just slide the spring over one wooden piece, get it in place, then use the pliers to pop it over the other piece. Fingers work fine too but pliers speed it up. I fear that may not make sense in words, but honest, once you get the hang of it, things move fast!